Here’s what you need to know about everything that’s going on and how to choose your own adventure! Are you interested in how resources move to grow thriving small businesses, develop equitable communities and address Minnesota’s most pressing challenges? 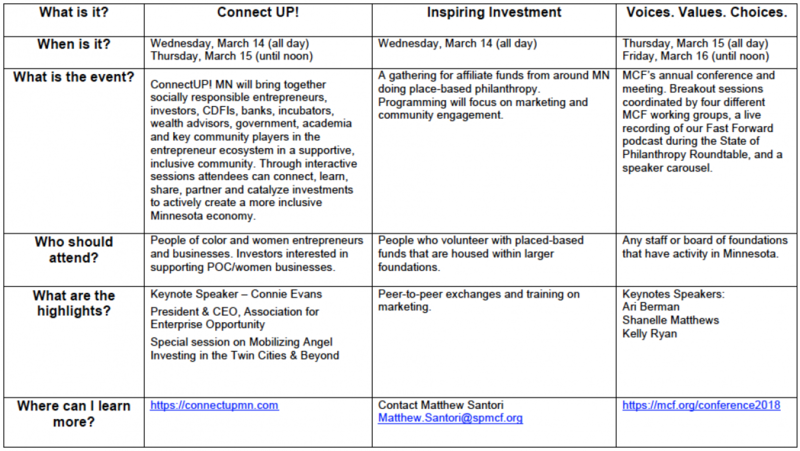 In mid-March, a unique cross-section of Minnesota’s philanthropic, entrepreneurial and investment leaders are gathering for a series of events to explore impact investing, social responsibility, the state of philanthropy, racial bias, voting rights, plus many more topics that will be of interest to you. Over the course of three days you’ll have a chance to choose from a menu of options based on your interests and areas of focus. We know it all might seem confusing, so we’ve pulled together this choose-your-own adventure guide. All three programs take place at the Radisson Blu Downtown Minneapolis.